The easiest way to enhance code readability is to standardize its organization. 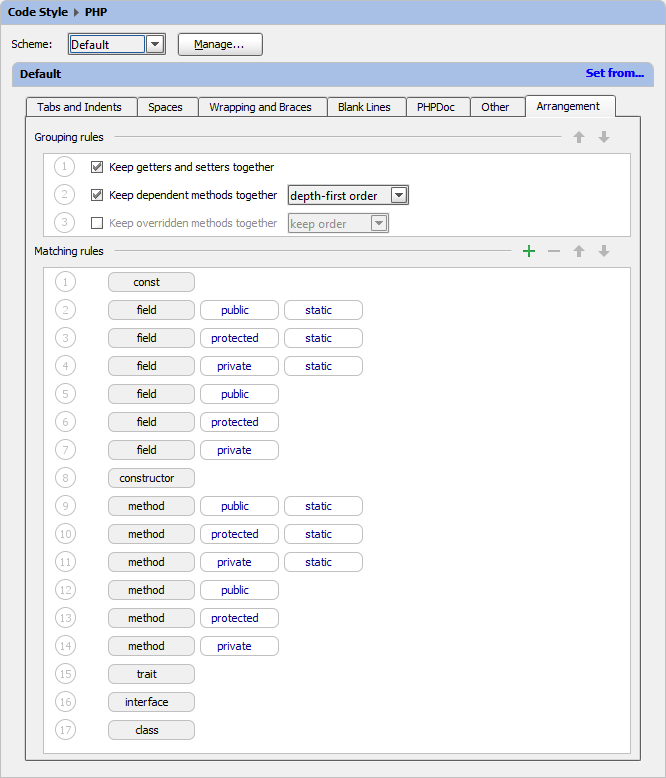 For example, you can specify methods to be ordered after fields or keep dependent methods together. The good news is that starting with version 6, you can have your code rearranged automatically! All code generated by PhpStorm will follow these rules, so you don’t have to worry about it at every turn. Enable Rearrange entries in Reformat Code options. Arrangement settings are available at Code Style | PHP | Arrangement. Allows you to keep getters and setters together. 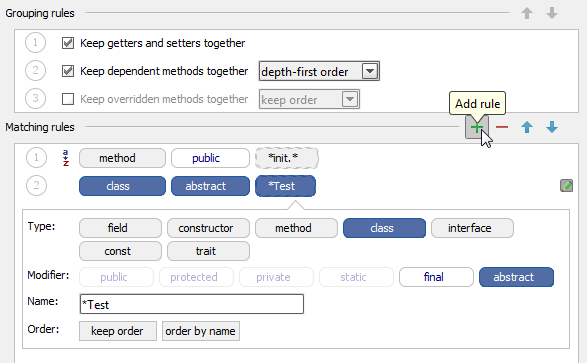 Allows you to group overridden methods by class and interface. For instance, your class implements ArrayAcces and Serializable interfaces, so you want to keep your methods grouped by the interface where they are declared. Keeps dependent methods together. For instance, service() method calls util() method, and you want to keep util() after service(). To create a new rule, click the Add rule button in the upper right corner of the rules list. Configure it by type and modifier, add a name rule (like “init. *” or “*Test”) and/or set order type, if needed. Feel free to share your feedback and submit bug reports in our issue tracker. Keep you code arranged with pleasure! This entry was posted in Cool Feature, PhpStorm and tagged code quality, PhpStorm, rearranger. Bookmark the permalink. When can we expect stable 6.0? Seems great, I will give PhpStorm a try! Really nice features, thank you. How can I rearrange so that getters and setters follow the order of the properties? I can only choce alphabetical order but I would like to have them in the same order as the properties. Can you create a feature request on http://youtrack.jetbrains.com/issues/WI ?